The Travelon Anti-Theft Classic Backpack has all the space, organization and protection needed in a day bag or carry-on. The front comparmtment has RFID blocking card slots, an open top zip pocket, two pen loops and a tethered key clip with LED light. The rear compartment is fleece lined to hold a laptop upto 15.6" and has a padded pocket for an iPad or tablet. The roomy main compartment has a wall pocket to hold large items. A top grab handle and add-a-bag strap make it versatile and easy to carry. 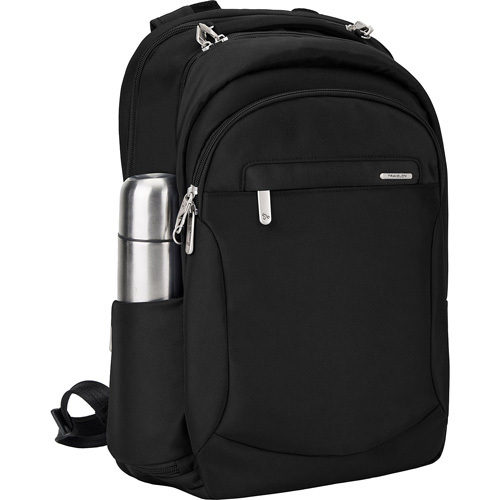 The Travelon Anti-Theft Classic Large Backpack-Black has many exciting features for users of all types. You can extend the lifetime of your Travelon Anti-Theft Classic Large Backpack-Black with the purchase of a FactoryOutletStore Factory Protection Plan. 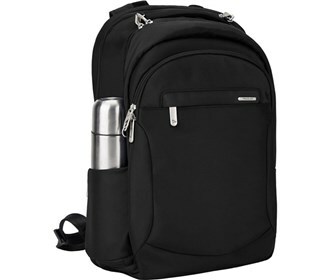 See the Travelon Anti-Theft Classic Large Backpack-Black product video above for more details. The Travelon Anti-Theft Classic Large Backpack-Black is sold as a Brand New Unopened Item.